Kicking off Theme Thursday – Science Fiction! Haz happined tu ME!!! Tehy putted me inna box an taked me inna vehicle taht wented sooo far away yu cannawt imagine an was uvver kitteh there nawt knowing what going on eever an big bipeds poked an proded an purrformed teh examination on me an eben taked my tempurchur!!! An tehn tehy taked me home an Trick an Angelmom an Freya sed I just hadda dreem eksept I smelleded funneh!!!!!!!!! Okay, I maked that up about Trick an Angelmom an Freya saying I waz dreeming. They haz teh abdukshun storees tu! Ai has hadded dat dreem tuu! Sept nawt wiff Trikk adn teh obberz, but still! Dat wuz teh aliyun muvvership? What else cud it be? My mom lubs me, her wud nawt du that, hadda be sumwun purrtending tu be her!!! An it be a playse taht making no esnse, iz awl weerd smells an cold shinee metal an fings! An I cannawt get tehre on my own even if I go onna balconee or run owt inna hall. So it MUST be!!! Ai dunno, papa myte be ablol tu duing such a fing. U shud seeing him wiffa brush adn flee koam. On mai belleh! No. Ai duz nawt. At awl. Ai rollz awn mai bakk as protest, adn bekum a hand trap if u tryez. Bofe mai minyunz lubs dem, tho. Ai nawt unnerstand. I hazza white mark on my belly taht mom an uvvermom call my smiley. Tehy say I smiles when I hazza happeh. I likes teh tummyrubs. Eksept when I inna playful mood. Tehn I tells mom tu get towl or sumfing so I can rassle wif her thru it. But mostly, I likes when mom an uvvermom ticklol my tummy. Sumtymz papa ketchez meh wiffa bellehrub wen ai is protestin. Fur a fyoo sekkundz aifinks, mebbe dis nawt such a bad fing, but den ai kom tu mai sensez, gib him teh “hao dayr u” luuk, adn roal tu mai feets wiffa mmrowl. Is kynda diskonserting, oberawl. Straynj, yeff. Ai is heer! Ai is heeeer!! *fwump* Is u der? Hewwo? Beem meh up Skottee!! Der am nawt ennee intelijint lifes daown heer!! Sept mebbe fur teh tygerz, but dey iz imprizund behyn barz bai teh loklol sabijez. Ifinkso yu an teh uvver callykos an torties, wif yur sordid minyuns, am doing a preddy darned good job as teh feline oberlords. *preenz* U knoz weer gettin lo awn teh sammin treets, ryte? Juss chekkin. 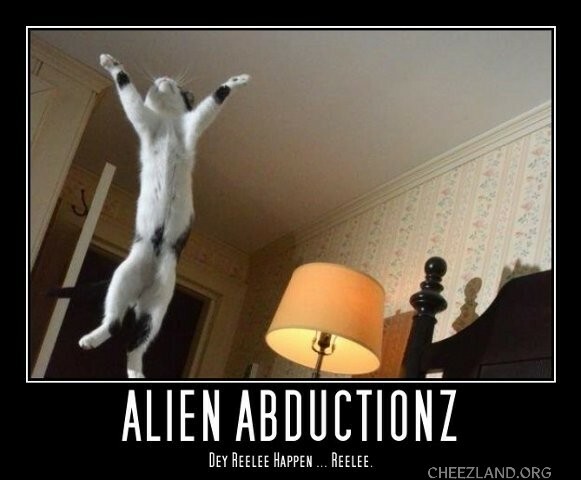 Time for us to be off to bed, I hope with no alien visits (other than Trick, who I’m pretty sure is an alien pretending to be a cat and who didn’t get the right manual…) Anyway, has a good nite, awl!!! Hee, hee !! Ai haz tu adjust faw teh past awl teh time, Mrrphh !! Ai had tu duz teh tyme warp. Wen ai nawt-sekkund started at DOP, it wuz free owerz inna past. Den dey moobd tu Skidattlol adn my klokks matchded cheeztyme. Nao cheezland is free owerz inna fyootur. Its lyke ai keep laggin furver adn furver behyn.